Deputy Minister Krassimir Zhivkov and three civil servants have been asked to take forced leave until the Prosecutor’s Office and the State Agency for National Security (DANS) conclude their investigation prompted by publications by Bivol revealing bribery and abuse of public procurements known as “GPGate”. This emerges from a response by the Government Press Office to a request by our editorial office. “In a letter to Prime Minister Boyko Borisov, Deputy Prime Minister Tomislav Donchev has asked the Chief Inspectorate to the Council of Ministers to carry out a probe of all individuals mentioned in Bivol’s article who have had an active relationship with a government administration or an executive body at the time of its publication in mass media. The employees involved – the Deputy Minister of Environment and Waters (MEWs) Krassimir Zhivkov, the Director of the Public Procurement Directorate Stanislava Yotova – Hristova, the employee of the State Fund Agriculture (SFA) Yanaki Cherveniakov and the auditor at the Executive Agency Certification Audit of European Agriculture Funds Lachezar Zolev are on leave until the conclusion of the investigation by the Prosecutor’s Office and the DANS,” says the reply by the Government Press Office. The names of these individuals are associated with nicknames and diminutive names (MEWs Deputy, Stanislava MEWs, Yanaki, and Lacho, among others) with entered amounts of money next to them in the “commissions” column of leaked secret accounting books of consultancy companies connected with GP Group. However, in our publication it is stated that only Stanislava Yotova – Hristova can be identified with certainty because she has worked on the water cycle project in the northwestern city of Vidin, carried out by the companies in question, and in the past she has been connected with the consultancy company “Rila Consult”. Whether “Yanaki”, “Lacho” and “MEWs Deputy” from the files are the same individuals as those on forced leave can be established only by the investigating authorities. Former SFA boss Yanaki Chervenyakov has already been removed once from his post after an investigation by Bivol into his unexplainable wealth and the construction of a guest house with European Union (EU) financing by his mother-in-law. After a lawsuit, he has been silently reinstated at the SFA. 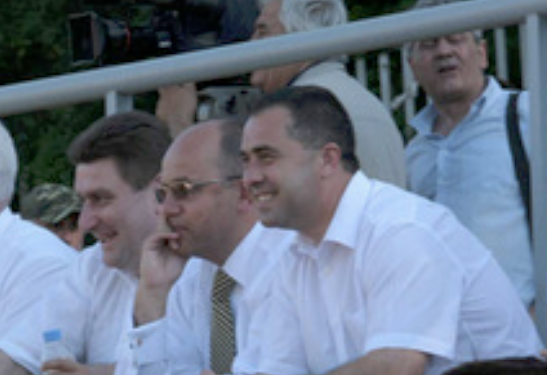 Deputy Minister Krassimir Zhivkov is seen as a person close to the Executive Director of Lukoil Bulgaria, Valentin Zlatev, who is believed to be the one with the actual control of GP Group, although he, himself, strongly denies such a link. GPGate is a series of revelations related to a large-scale corruption scheme to abuse European funds and the country’s budget through manipulated public procurement by inflating costs of materials, construction works and subcontracting. The established so far abuses in the amount of hundreds of millions of euros lead to the conclusion of huge misappropriations. All of them have been committed by several consultancy firms affiliated with GP Group, which is the largest public procurement contractor in the construction sector. In order for the bidders to secure smoothly their wins, contracting authorities and watchdog bodies have been motivated with bribes by the consultants. The concrete amounts are carefully entered as company expenditures in the “commissions” column of the consultancy firms’ secret accounting books. The “profit” from the projects is being syphoned through offshores and individuals associated with Russian oligarchs and Bulgarian organized crime groups. It should be noted that Prime Minister Borisov reacted immediately after the publication and on September 11, he instructed the Interior Ministry to carry out a probe. The scandal, however, was ignored by the Prosecutor’s Office and the media until the evening of September 14, when Bivol’s journalist Dimitar Stoyanov and his colleague of Rise Romania Attila Biro were arrested. They were attempting to salvage documents from the office building in the capital Sofia which houses the offices of GP Group and the consultancy companies. The handcuffing of Stoyanov and Biro in a field near the western town of Radomir, where the police watched the documents being set on fire, made the headlines of international medi, reporting that investigative journalists had been arrested while investigating EU funds abuses. However, prior to that, the Main Directorate for Combating Organized Crime (GDBOP) had ignored the fact that documents are being removed from offices and destroyed. For two days, following Borisov’s order, the anti-mafia police did nothing to prevent this crime. The inactivity of the Prosecution’s Office proved even more persistent and lasted a full week after our first publication. Eventually, when outraged citizens protested in front of Prosecutor General Sotir Tsatsarov’s office, an investigation was commissioned to DANS. Immediately thereafter, the Prime Minister ordered that the individuals mentioned in Bivol’s publication be removed or take forced leave. At the moment, it remains unclear what is going on with the documents that have been salavaged from the fire or where they are. DANS has not yet shown interest in getting acquainted with the electronic documents available to our editors, while the Prosecutor’s Office clearly does not consider that there is an organized crime group since their investigation is not conducted by the Specialized Prosecutor’s Office but by the unit at the Sofia City Prosecutor’s Office that deals with the misuse of EU funds. The investigation is part of the project “Exposing fraud in EU-funded projects in Romania and Bulgaria” by Bivol and Rise Romania, funded by the European Commission’s IJ4EU Fund and the European Centre for Press and Media Freedom (ECPMF).